Model 6039 | Associated Equipment Corp.
0-600 AMP Load Tester. Easy-to-read DIGITAL voltmeter and ammeter combine with the versatility of a carbon pile load to give a quick and precise determination of battery and charging system problems. Spring loaded to shut off automatically. 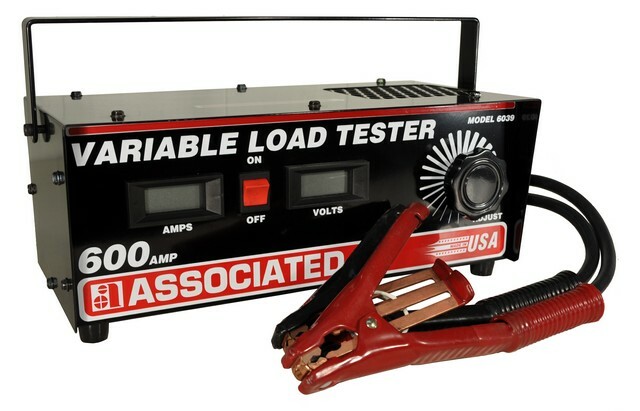 This 0 to 600 Amp tester has unique curved discs to prevent hot spots. Heavy duty clamps with “Flexi- Spring” cable guards provide added value. MADE IN USA.